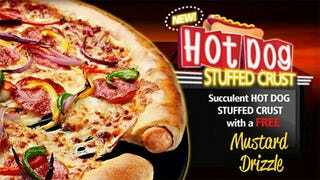 Having made the rounds in Canada, the UK and Australia since 2012, Pizza Hut is finally bringing its bizarre hot dog stuffed crust pizza to U.S. stores later this month. Tentative hooray! This news came to me by way of a local long-time Pizza Hut employee, who informed me that most stores in the Atlanta area have already received their shipments of bland sausage and mustard drizzle in order to facilitate the meat-filled monster’s launch. Further confirmation comes by way of TheImpulsiveBuy, a reader of which sent in a snap of a promo image teasing a June 18 release. As the country’s most dedicated snackers begin planning their days off for this grand occasion, a bit of advice. If you’re impatient, try calling your local store to see if they might be offering the item ahead of the official launch, a tip that’s sure to endear me to Pizza Hut employees across the country. Second, don’t go overboard. Start slow, maybe with a nice plain cheese pizza with hot dog crust, before escalating to all the things. That way if the first one kills you your surviving relatives will have $30 more to divvy up. Think of the children. Snacktaku will have a full review as soon as this is a thing that can go in our mouths.